If you are the type of person that loves to freak people out, or you're already thinking about what cool and geeky tricks you can play on friends this Halloween, then look no further: Researchers from Tokyo University have your back with PossessedHand. According to New Scientist, the strange hand-and-finger contraption was created to help people with limited time learn to play an instrument, particularly stringed ones. 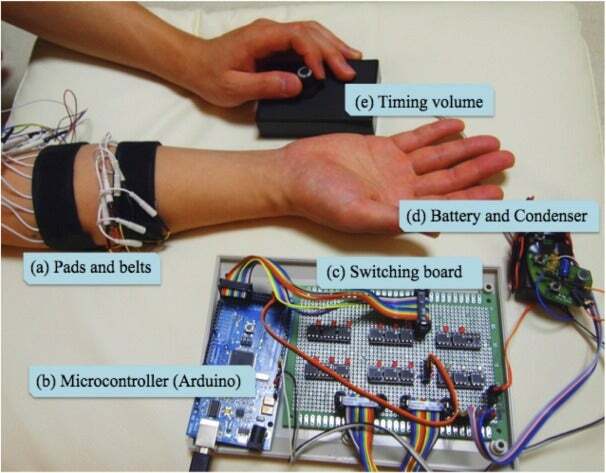 The belt worn around the arm contains 28 electrodes, which work together to stimulate muscles in the wrist and fingers without the use of the brain. Although this technology isn't new, researchers believe that it is certainly more comfortable and less invasive than previous devices--such as gloves or skin embedments--as well as being easier to control the objects in the hand. In fact, the electrodes feel more like small massages rather than slight electric shocks. Of course, while PossessedHand may be a good guide to teach you how to play, it can't make you properly pluck strings--just hover your finger over the correct place. It seems a little strange to call a seemly innocent device "possessed," then, although some testers did feel that it was like their body was being hacked. While it's not exactly a mass-market device, the technology could be used to help stroke patients regain the use of their hands, either fully or just for more-simple movements like making sign language. Check out the video to see the hand machine in action.